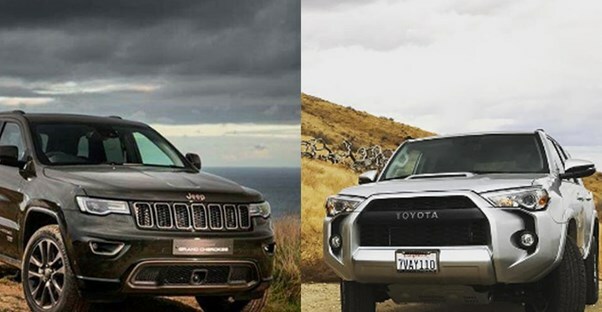 The 2016 Toyota 4Runner and 2016 Jeep Grand Cherokee are monsters of off-roading. They are powerful enough to take on just about anything, but which is right for you? This comparison is designed to help make your decision as easy as possible. They’re both great SUVs, so this could be a tough breakdown. Many people use the cost of a vehicle as a big deciding factor., but there are plenty of other factors a person should look at before they decide to buy the Toyota 4Runner or Jeep Grand Cherokee. As far as price, the Grand Cherokee has a starting MSRP of $29,995 for the Laredo model. The Toyota 4Runner SR5 has a starting MSRP of $34,010, which is substantially more expensive than the Grand Cherokee. Anyone that’s getting a Grand Cherokee or a 4Runner wants plenty of cargo space. Whether you’re hiking or going shopping, you need ample space to store all your gear. The Jeep Grand Cherokee has a maximum cargo capacity of 68.3 cubic feet with the first and rear seats folded. With these seats raised, it has 36.9 cubic feet. The Toyota 4Runner is the clear winner when it comes to cargo space. With the seats down, you get an ample 88.8 cubic feet of room. That’s 20 more cubic feet than the Grand Cherokee. Even with the seats up, you get 46.3 cubic feet of space. Gas may be going down, but that still doesn’t mean you want to spend more each week filling up. Fuel economy is still a big concern. In this case, the two vehicles are in the same ballpark, but there's a clear winner. The Jeep Grand Cherokee comes out ahead with 19 mpg in the city and 26 mpg on the highway. The Toyota 4Runner gets 17 mpg in the city and 22 mpg on the highway. Are you buying your SUV so that you can go camping or boating? You’ll need to know if your vehicle can tow. The Jeep Grand Cherokee can handle more weight with 3,500 lbs. standard and 6,200 lbs. maximum towing capacity. The Toyota 4Runner has a significantly lower towing capacity of 5,000 lbs., making the Grand Cherokee the winner here. Did someone say road trips? Who doesn’t love going on a road trip in their SUV? It has more room than a sedan, but if you're going to be in it for awhile, your vehicle needs technology features to keep you entertained. The Jeep Grand Cherokee comes with a standard 5.0-inch touch-screen display, six total speakers, USB ports, audio input jack, and Bluetooth streaming audio provided by Uconnect 5.0. The 4Runner gives the Cherokee a run for its money with a 6.1-inch touch-screen display, eight total speakers, auxiliary audio jack, USB ports, advanced voice recognition, hands-free phone capability, Bluetooth connectivity, HD traffic and weather in metro areas, and an integrated backup camera.